Another important reason to visit Shanghai is the rich cuisine. This immigrant city has over 1000 restaurants that offer every imaginable type of food from the great regional cuisines of China and some neighboring countries, so that you have plenty to choose from, if the local East Chinese cuisine - Fujian - is not agreeable. There is no single Chinese cuisine, but rather four main cuisines within which there are further regional variations; these differ considerably, as will be explained below. There are several features shared by all of the regional cuisines. As the Chinese food culture has developed over thousands of years, there are some seemingly poetic observations that relate to the serving order, but also individual dishes that are important. Thus, rice and soup are preferably served toward the end, as these foods will fill any space still available in the stomach. Whereas rice is served as a side dish with the food in European Chinese restaurants, it is only served upon request in the Chinese restaurants in China, and doesn’t necessarily come with the meal. In addition, desserts are practically unknown. Chinese people like to nibble, and consider desserts as more of a between-meals snack. Incidentally, when ordering several dishes at a Chinese restaurant, all the food will be served at the same time, since there is no tradition of a succession of courses, or the sequence of courses can also be left to the guests. The guests themselves should therefore be prepared to assume responsibility for the sequence by placing the orders separately. Otherwise, there are only a few rules of conduct for visiting a Chinese restaurant, and these will be discussed separately. The only significant obstacle is perhaps eating with chopsticks, which should be practiced beforehand. East Chinese cuisine, which is found in the provinces in the Yangtze River delta, is distinguished by a preference for sweet taste. The relatively heavy dishes that are prepared with oil are seasoned especially with ginger, scallions, rice wine and sugar. In "red cooking", meat or fish is cooked in dark soy sauce and rice wine. 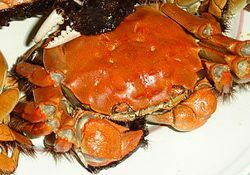 Fujian cuisine employs a great deal of fish and crabs, but the waters are now so over-fished that they must resort to breeding the animals. Among others, this is true of the Chinese mitten crab (pictured at right), which is considered a delicacy in Shanghai. Meat dishes are made primarily from pork, chicken or duck, but also from frog and snails. Noodle soups and dumplings are eaten for a snack. The region around Shanghai is also known for the high quality teas that are grown in the humid climate. Green tea should always accompany a sumptuous dinner, as it helps to make the high-fat diet more digestible. Teas such as green tea, jasmine tea or oolong tea also make great souvenir gifts for the friends and family back home. A visit to a tea house in the old city where the traditional tea ceremony is performed, is highly recommended. 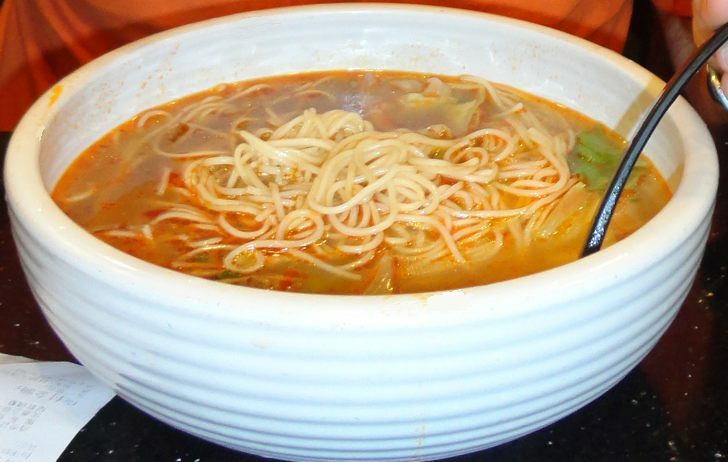 North Chinese cuisine uses vegetables such as Chinese cabbage, cucumber and celery. The types of meat served include pork, beef, and lamb, and chicken and duck are specialties. The traditional spices are ginger, garlic, sesame oil and soy sauce. Dumplings, millet porridge, or sesame bread are served as side dishes since rice doesn’t grow in the north. The cuisine from Southern China – from the Hong Kong and Guangzhou regions – is the best known in the West. The dishes contain cabbage, onions, and garlic freshly cooked in a wok, and are generally not too spicy. The South Chinese cuisine employs the broadest range of types of meat, including beef, pork, chicken, snake, worms, and even dog. 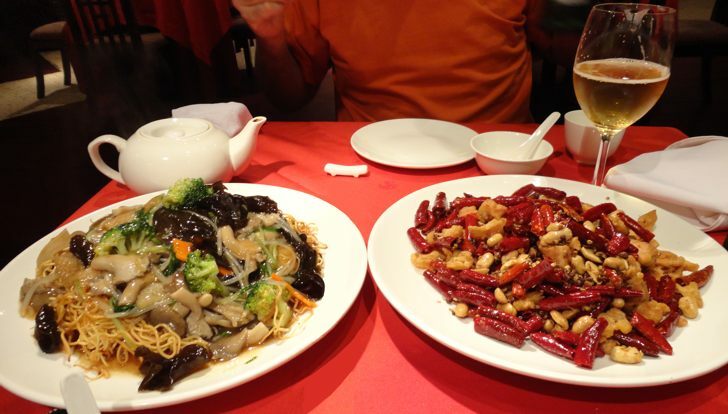 Sichuan cuisine, coming from Western China, is notable for its spiciness since the dishes are traditionally seasoned with white pepper and Sichuan peppers, while more recently chili peppers introduced from the Americas are used. Typical vegetables used include garlic, Chinese cabbage, and bamboo shoots. Pork is the most popular meat in Sichuan, while chicken and fish are served more in Hunan.